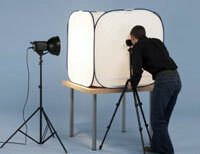 Space-strapped photographers and manic eBay product shifters will love this handy portable studio solution. Producing high quality, well-lit, studio-style photographs can be quite a challenge if you don't happen to have access to a studio set-up at home or be the proud owner of an expensive camera. Although half-decent pictures can be obtained courtesy of some Blue Paper style bodging about with white paper, desk lamps and sticky back plastic, it's hardly the best solution if you need to be able to consistently take professional looking photos. The Lastolite Cubelite kits look to provide a handy solution here, bundling all the components you need to knock out fab shots from the comfort of your own home. The Cubelite cubes come in a range of sizes, from two foot up to six foot six inches, with each package including a 500w tungsten light and tripod, two-sided silver and white reflector, white background and carry case. We plumped to review the 2 foot kit and the first surprise was the size of the box it all came in - it was enormous! On unpacking the contents, we were suitably impressed by the pro-looking lamp and the tripod that extended all the way up to our ceiling. Releasing the Cubelite from its natty blue bag was fun: a quick shake of the thing and - wooowargh! - a white mini-tent pops out! Although we chose the smallest size, it was still quite a large beast, and you'd need a fair size table to accommodate the set-up - we reckon you could probably take the 6 foot tent to Glastonbury and provide accommodation for a few friends. Following the straightforward instructions, we stuck the lamp on the tripod and set it up so that it shone it through the fabric from a distance of 18 inches. Inside the light tent, we used the elastic loops and supplied clips to fix the white background and then positioned the reflector inside, on the opposite side to the lamp. We grabbed the nearest object we could find (an apple), lobbed it into the middle of the tent and then angled the reflector about until we got the light looking jus' so. A useful, albeit minimal, single sheet of A4 paper advised us on how to sort out the colour balance on our camera, and before long we were knocking out some s-s-s-studio style photos with ease, with the diffusing material making it a cinch to grab attractive, shadow-free results. We liked the Cubelite a lot, and it's a great product for people who need to be able to take high quality images without the hassle of erecting a permanent studio. We found the Cubelite easy to lug about, although the towering tripod and heavy duty lamp may have bordered on overkill for such a small set up. It's not cheap at �256 (excl VAT) either, but for working photographers and mustard-keen eBay sellers, it could prove a wise investment and it's a product we're happy to recommend.